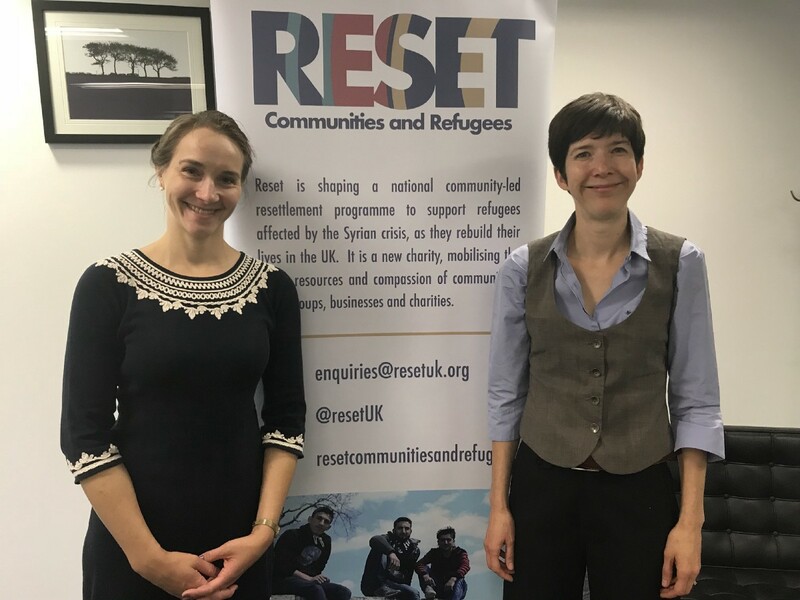 Dr Kate Brown and Dr Monika Kruesmann have joined the Reset team as co-Directors (a job share), and introduce themselves here. It's not every day a job comes up where we feel really inspired, both professionally and personally. When we were offered the chance to lead Reset as Co-Directors, however, that's exactly how we felt! Here was a role that perfectly matched both our professional backgrounds and interests, and our own personal priorities and passions. We are really excited to introduce ourselves to you here, and say how much we are looking forward to meeting others who share our passion for community sponsorship, and our commitment to making this a cornerstone of policy and practice throughout the UK. "I'm a charity sector leader, researcher and educator. My first career was as a secondary school Citizenship teacher, supporting young people to explore their power for change, and I first moved to the charity sector (at national charity Think Global) to support other teachers to develop a global dimension to their lessons. Most recently, I've led Learn English at Home (LEAH), a charity mobilising communities in SW London to enable refugees and migrants to integrate through language support. LEAH trains local volunteers to go into the homes of vulnerable and isolated adults and offer bespoke, 1:1 English support. I've seen for myself the power individuals and communities have to bring about change, and I'm excited by community sponsorship as a powerful and tangible way to do just that"
"I have a very personal interest in refugee issues, as my own parents arrived in Australia as refugees in the 1950s. Also, I'm a migrant to this country myself, which, whilst different from being a refugee, gives me some understanding of the total upheaval and life change that moving continents involves! My professional background is broadly split between Government (I worked for almost a decade with the Australian civil service), the charity sector (I was previously Head of Programmes at the education charity Think Global), and academia (I have a PhD in International Relations from the London School of Economics, where I examined norm diffusion, or the way ideas move around the international system)." Having worked together previously at Think Global, we're very pleased to have the opportunity to collaborate again as co-Directors, and are looking forward to realising the potential of a job-share to bring flexibility, challenge, and resilience to the role. Kate and Monika Joining the Reset Team is also published in Reset UK on Medium, where people are continuing the conversation by highlighting and responding to this story.